Dialing 911: You may not be able to contact 911 or equivalent emergency services though the Ryng Phone System in the event of a power failure, network, internet, or VoIP provider outage, or other service interruption. It is important that you establish and maintain a separate method of dialing 911 - using a cell phone or a standard phone plugged into an active telephone jack, for example. Power Outage: In the event of a power, network, or telephone service outage, the Ryng Phone System will not function. Providing 911 Location Information: Depending on the state and/or country in which you are using the Ryng Phone System, you may be required by law to provide your VoIP provider(s) and/or 911 emergency services with the correct phone number and address associated with your VoIP service. The Ryng Phone System does not provide this information. It is your responsibility to comply with this law if it applies in your jurisdiction. FOR MORE INFORMATION:This is a quick setup document only. Further information on the Quick Setup wizard and other ongoing administration tasks is available in the Ryng User Guide. The Ryng User Portal facilitates basic user tasks, such as voicemail management, password maintenance, and call forwarding setup. The Ryng Administration Portal provides advanced configuration features, including the setup of auto attendants, conference calling, and call routing. Both portals are available by using a web browser to access: cloud.ryng.us. For assistance with your Ryng Phone System product, contact Ryng through our support website at www.ryng.us. Upon subscribring to a Pay-As-You-Go or monthly plan, your dedicated Ryng Phone System will be initalized on our hosted platform. Within 2 business days, an email will be sent to the Administrator letting that individual know that the setup has been complete. Navigate to the link provided in the email to the Administrator. Read through the terms of service. Click the checkbox next to I Accept The Terms of Service. Fill in the Email Address, Password, Confirmation, First Name, and Last Name fields for the person that will be administering this system. An extension will have been automatically selected, but may be changed if desired. Note that this account will be able to add, change, and delete all features and settings on the system. Please ensure the person you assign should have these privileges. Non-administrative users will be created later on in the setup process. If cloud based Ryng Phone System, go to Step 7. If using on-premise device and the administrator will be making use of a VoIP phone, click the Select Phones to Assign dropdown box, and click the name of all phones that should be assigned to the administrator. If the administrator would like to enable basic integration between the Ryng Phone System and their mobile phone, enter their mobile telephone number in the Mobile Number field. For more advanced mobile integration options, please refer to the full user guide. Click the Save button to create the administrator account. The Ryng Phone System contains a three step walk through of basic setup steps. Read each set of help text, then click anywhere on the screen to proceed to the next step. On the People page, click the Add Person button. 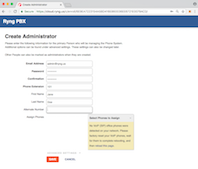 Fill in these fields in the same way that the administrator’s information was filled out, including the user’s email, name, mobile number (if desired) for basic mobile integration, and advanced settings. Note that there are no fields for assigning a password to the user. The user will receive an email from Ryng, sent to the address specified in the Email Address field on this page. The email will contain instructions for the user to set their own password on the Ryng Phone System. Click the Save button to create the account. Repeat the above steps for each additional user that needs an extension on the system. NOTE: No Phones Available is not relevant for the Ryng Phone System in the cloud. This section is only used for on-premise devices. Click the Next button in the bottom right corner of the screen. This will load the Phone Services page. Click the Add Phone Service button. Fill in the Phone Number, Username, Password, and Server fields with information supplied by your VoIP provider. Click the Test button. The Ryng Phone System will attempt to register with your provider and make a test call to the Ryng test service. If the test was successful, you will see a green Success message on screen. Click the Closebutton to proceed. If you see a failure message, click the Close button and then double check the information you have entered for your VoIP service. Note that the Ryng Phone System will let you save a VoIP service that does not pass testing, however it is likely that you will not be able to make or receive calls using this service until the errors are corrected. Under the Incoming calls for section, the built-in auto attendant application will be selected by default. The built-in auto attendant directs callers to enter the extension they wish to reach, or to push pound (#) for the company directory. If calls received through this phone service should be directed to a different location, select the desired location from the drop down box. Click the Next button in the bottom right corner of the screen. This will load the Publish page. Click the Publish Changes button. The Ryng Cloud service will check for firmware updates, and then activate your most current configuration. Note that on a brand new system, firmware updates may be waiting and may take several minutes to download and install. Once the publishing process is complete, click the Finish button. The Ryng Phone System is now configured, and ready for use. Your Ryng Phone System is now ready for use. For assistance setting up additional features, such as conference calling, additional teams, or mobile phone integration, please see the Ryng support website at http://ryng.us.